This was an improvisational quilt so when I started it I didn’t know exactly how it would end. 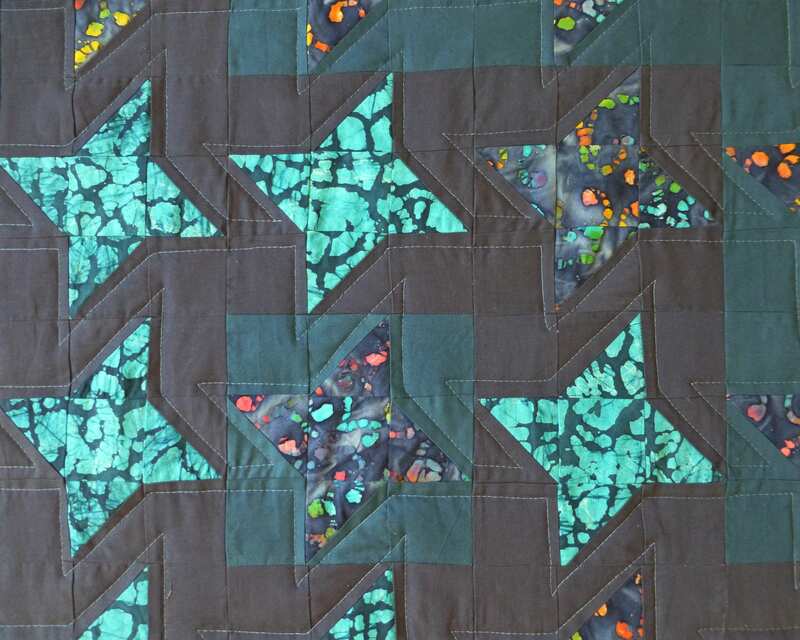 My thanks go out to all my fellow quilters who made suggestions on how to do the quilting. I loved reading your comments and I loved the way you made me think about my design decisions. 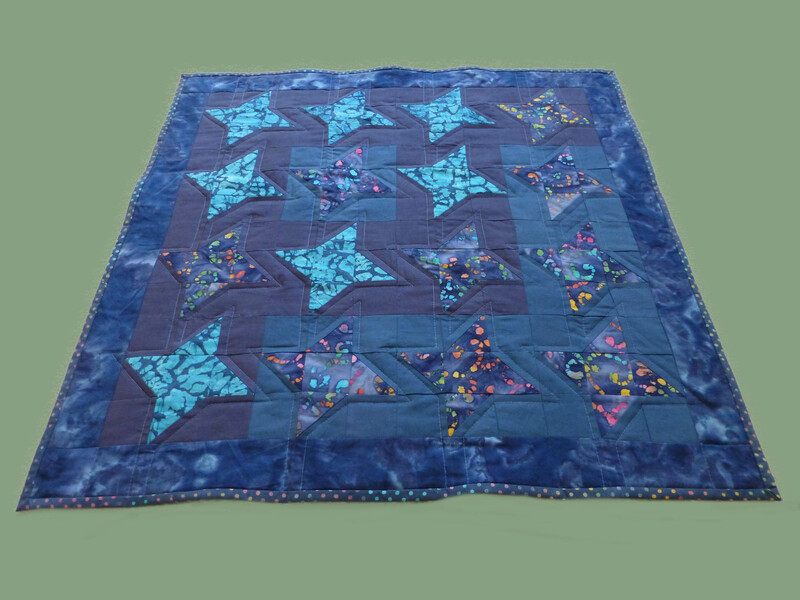 Some of my decisions were based own limitations as a hand quilter and some on my desire for a relatively speedy result. One decision was based on a material constraint. After all that anticipation, the sparkly thread I had planned to use turned out to be a total PITA to use, something sewfrench had hinted might be a possibility. I couldn’t get the thread through the eye of either a hand sewing needle or the machine needle without it unraveling, so I had to put it aside and use ordinary cotton thread. I actually used different colours on the top and in the bobbin, which is risky unless your tension is perfect. My tension wasn’t perfect, but I think I got away with it. I’m happy with the finished result and I’m happy with the quilting. Now all I need is for someone to get pregnant so it can find a new home. I wonder if any of my fellow quilters would be willing to help out with that one? Update: Turns out a member of my extended family had a happy accident not too long ago and there is a baby on the way. The quilt will soon be winging its way across the ocean to join the mother and father to be. Funny how the universe provides, isn’t it? It’s all put together. Not my best work, but I still quite like it and quilting will fix the minor imperfections. Right? I am still eying the sparkly blue thread I bought with great anticipation because I think it’s going to look terrific against the other colours in the quilt. But I have no idea how to actually quilt it. I’m inclined not to do anything special on the borders due to those minor imperfections I mentioned earlier, in particular a small amount of waviness, so I expect to go edge to edge. I won’t be using free motion quilting either, because I don’t know how to do that and I don’t have the time or inclination to learn just at the moment. Any suggestions? The top measures 29 by 29 inches by the way. Update: Thanks to everyone who made suggestions. I enjoyed reading your comments. Here’s how the quilt ended up. 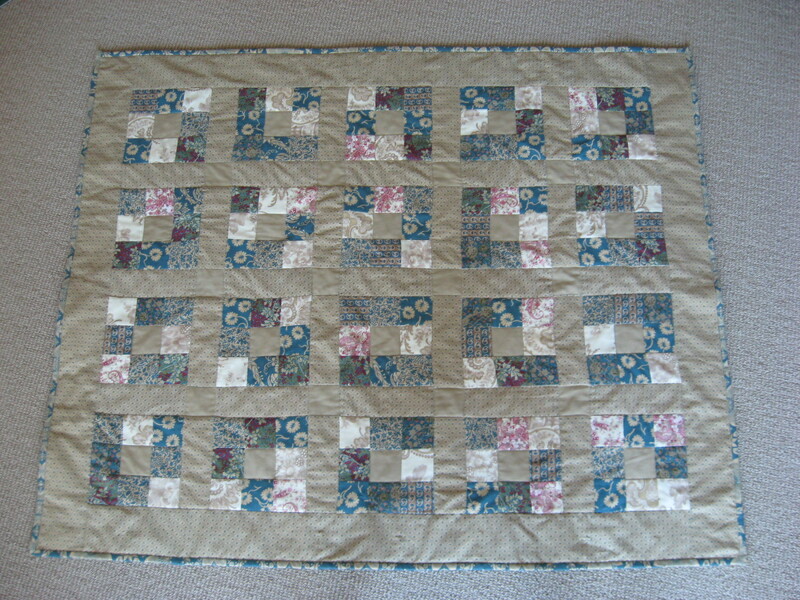 If you reached this post via a search engine and you want to fast forward to the finished quilt, here it is. Otherwise, please read on. Spotlight had a Scratch and Win card bundled in with their mailing recently. I scratched and I won. My prize was a modest $5 gift voucher but it made me feel like a winner. 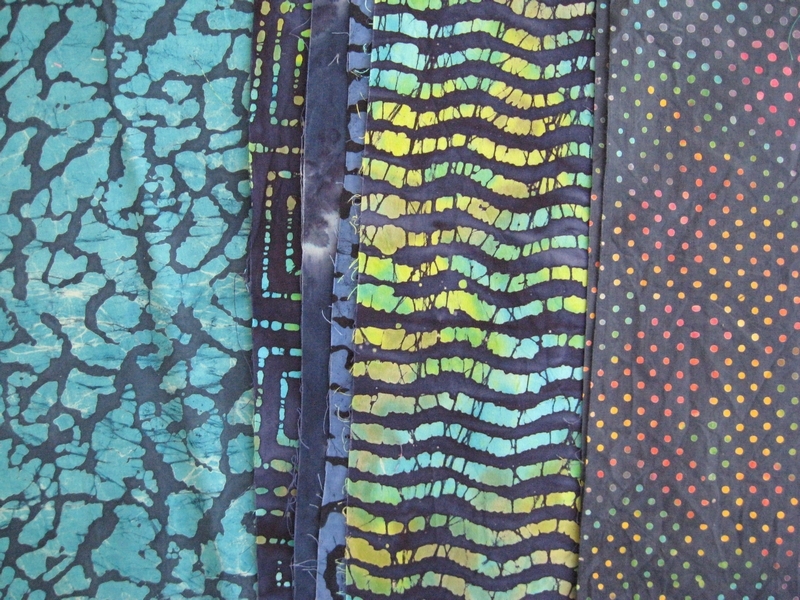 I took home a set of eight navy blue batiks. The eight became seven almost immediately. I culled one of the fat quarters straight after the pre-wash. It developed some red watermarks that make me think the colours weren’t stable. Between that and the really poor print quality on one of the other fabrics I was really glad I hadn’t paid full price. If I had, I would probably have marched right back to Spotlight and requested a refund by now. The plan is to make a cot quilt. I’m going to use friendship stars and call the design Starry Night. I won’t be following a pattern. If I run out of one fabric, I’ll pick another. I have some sparkly thread that tones in wonderfully with the batik at the bottom of the pile in the photo.The sparkly thread will feature in the quilt, somehow. Finally (and this is unrelated to being improvisational), it won’t be professionally quilted. I’m still suffering sticker shock after getting long-arming quote for the bento boxes. Without disclosong the full amount, let’s just say it was more than $100. Ouch! I’m not very good at estimation. 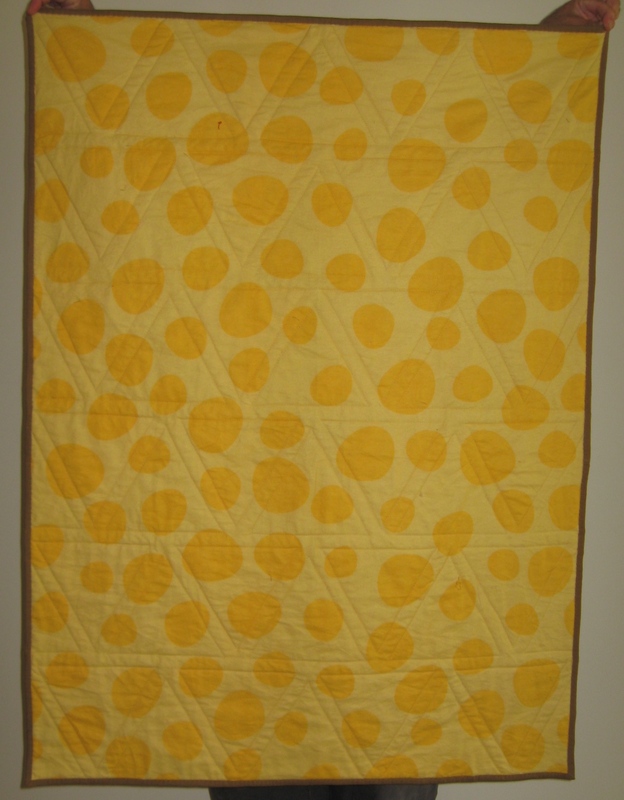 Once again, I completely under-estimated the amount of time it would take me to make this cot quilt. Unpicking never helps get the project done and there was plenty of unpicking with this one too. I used my brand new walking foot to echo quilt the pyramids and I’m pleased to report it worked well. In fact, it worked so well that I’m going to rip out all the machine stitching on the modified Dolly Madison Star quilt and machine quilt it in the ditch all over again. I can hardly wait. No, really. Even though this quilt measures roughly 34 by 45 inches finished, it was tricky to work the bulk of the quilt through the throat of my sewing machine. There was also an unexpected problem along the way – the quilt top touched against the part of the machine that holds the needle and goes up and down (which I’m sure has a name) and a speck of sewing machine oil was transferred to the top. I treated it with laundry soap, but this one will definitely need a wash before it goes anywhere. The echo quilting was more of a pain than I expected it to be. The quilting wasn’t done in long straight lines, or even continuous curves, so I found myself starting and stopping frequently and then needing to travel to my next pyramid. For a positive learning from this project, the hand basting didn’t take that long and I’d do it again for the stability it gave the quilt sandwich. 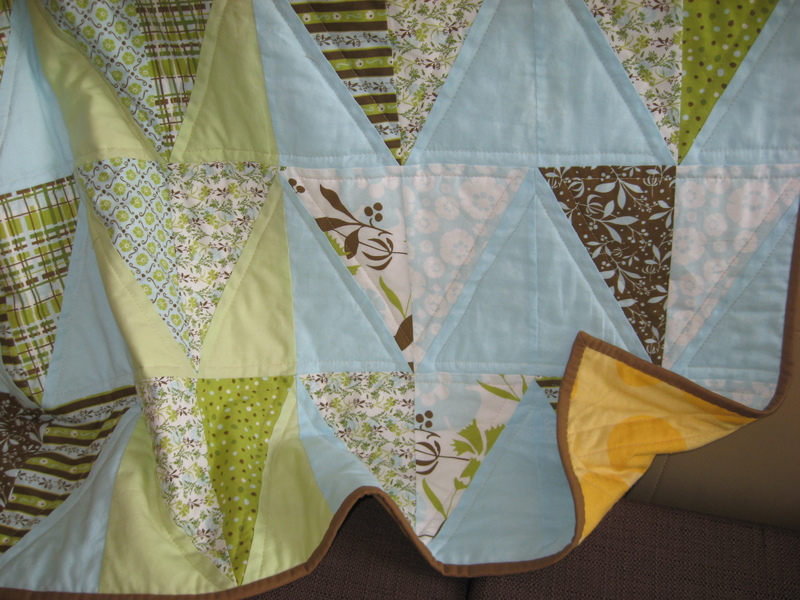 The presence of pins would have made it just that little bit more difficult to position the quilt at the right starting point. As it was, I had to hold the presser foot lever up by hand to give sufficient clearance while positioning the quilt top to start quilting. Time and time again, I would start sewing without remembering to put the presser foot lever down again and the stitching would go all over the place. There’s a saying about idiots being the ones who repeat the same error over and over. By that standard this quilt provided ample evidence of my idiocy. Now that this quilt is ready to gift, I think I’ll move back to my house blocks. Once they’re cut, they come together quite quickly. 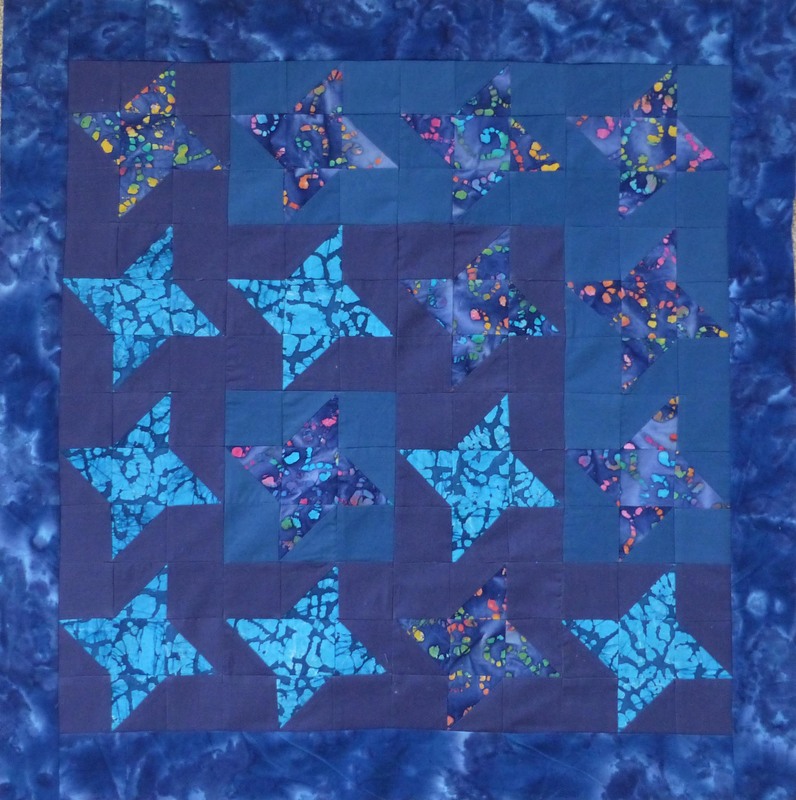 I’m working to a vision of a 9 by 9 house quilt with blue sashing. 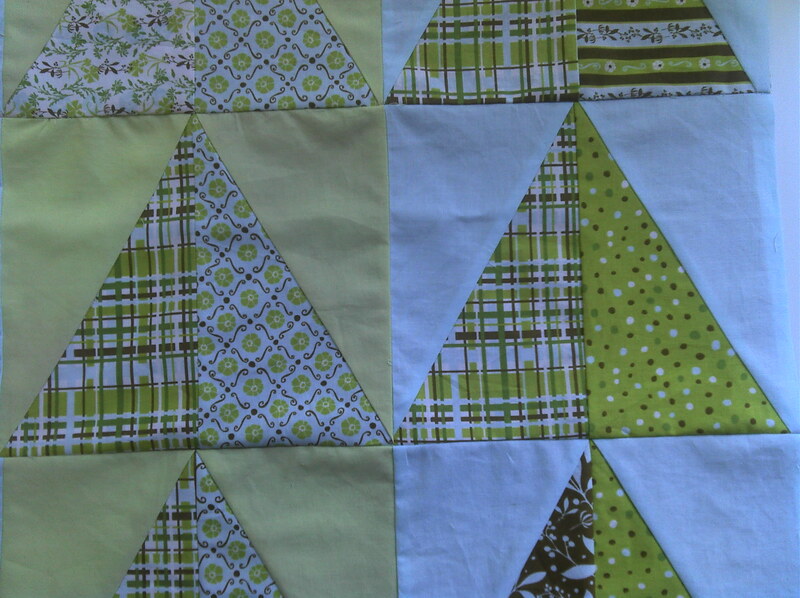 I finally got all my pyramids done and the top for the cot quilt is complete. There is one howling error. See if you can spot it – I’ll point it out at the end of this post. I’m not sure I can fix this error as I’m pretty sure it started with the cutting, and I have no more of the printed fabric. So I’ll keep going. In my defence, I’m not going to pull out that “Only God is perfect” line that some quilters use to excuse their errors. I messed up. Simple. It has nothing to do with making a deliberate mistake to avoid emulating the perfection of a Supreme Being or Higher Power. Michelle over at Sleepy Cat Hollow suggested flannel backing which I thought was a great idea. I’m not generally a big fan of flannel because I find it wears badly and it has a tendency to pill. In fact, Spotlight had a pale green flannel on the shelf but it was already looking worn and lumpy while still on the bolt. I couldn’t buy it even though the colour was a good match. Instead I picked up a warm and cheerful yellow dot flannel that doesn’t match any of my top colours, though it doesn’t fight against them either. I’m going to make the backing work through sheer force of will. And if that doesn’t work, I might try applique. I’m going to try a different method of making the quilt sandwich this time, based on some ideas from Sharon Schamber and an idea picked up from Perfect Hand Quilting Without Pain by Liuxin Newman, which I borrowed from the library. 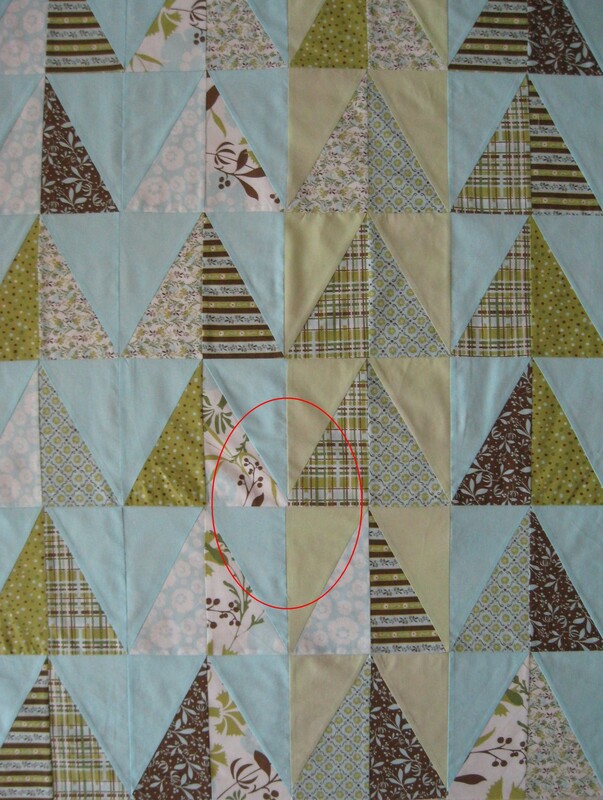 Sharon Schamber says that starting your pinning or basting in the middle of the quilt sandwich is tricky and I agree. She has a clever method of starting at the bottom and smoothing and controlling the fabric and batting layers using wooden batons, which looks like it would work. I don’t have any batons to hand and don’t want to ask my beloved to help because I don’t know what length to ask for. Sharon Schamber also advocates tailoring-style basting instead of using safety pins. I see her point and I plan to try it becase the safety pins DO get in the way, soemthing I discovered while working on the still unfinished Modified Dolly Madison Star Quilt. The third idea I’ve taken from Sharon Schamber is to cut your batting so it’s the same size as your backing. Don’t know why I hadn’t worked that one out by myself. Liuxin Newman talks in her book about how puckering is most often caused by uneven stretching between the layers. The Modified Dolly Madison Star Quilt is actually so stretched that I’m planning to unpick all the machine stitch in the ditch quilting. Rather than using batons, Liuxin Newman talks about rolling the layers. So off I go, with a little bit of Sharon Schamber and a little bit of Liuxin Newman. Finally, here’s the problem. Sorry the red line is a bit too thin. I was using unfamiliar photo editing software this time. My mother-in-law gave me a bundle of 5 by 9 inch pre-cuts last year for my birthday. They’re in pretty shades of blue, green, ivory and brown and are a combination of subtle and bright shades. I had in mind to use them for Dresden Plates but I fell out of love with Dresden Plates immediately after making my first one. Recently, our lovely yoga teacher Erica announced that she is expecting. In class we are doing more and more poses to strengthen our pelvic floors. For support of a different kind, I decided to make her a baby quilt. I went boldly ahead with my rotary cutter and without a pattern. I’d had a vision of diamonds so cut each pre-cut rectangle from corner to corner and then sewed a plain triangle to each right triangle, right down the hypotenuse. There was much unpicking in the beginning as I hadn’t fully got my head around a right vs left triangles. 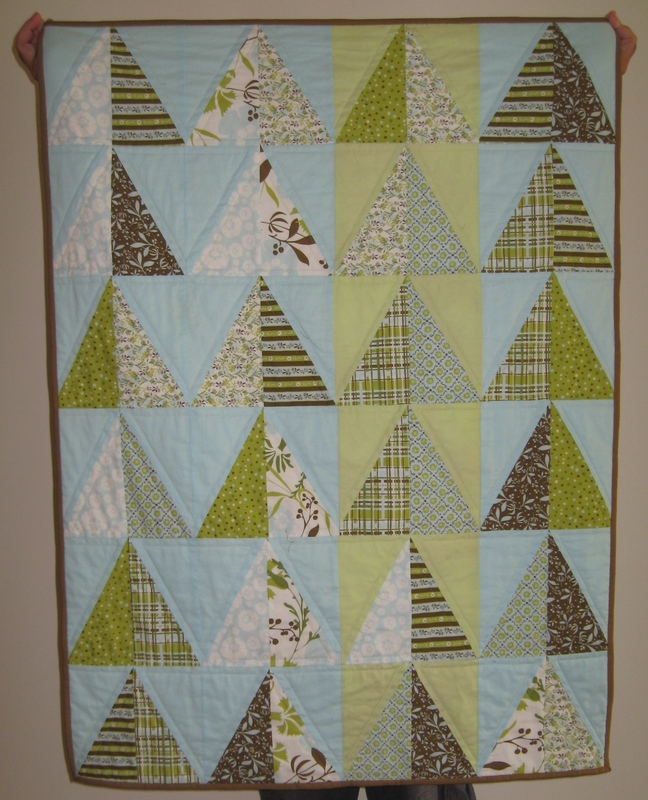 The diamonds became pyramids and the baby quilt is slowly becoming a cot quilt. I discovered along the way there was a bit of variation in the size of the pre-cuts. I don’t normally trim my blocks before assembling them, but in this case I had to. My conclusion is that it’s quicker, in the long run, to measure and cut carefully than to just cut and sew, simply to reduce the rework along the way. I don’t know if Erica is expecting a boy or a girl, but I do know she stops teaching next month so the pressure’s on to get the quilt finished before she leaves. I’m not that happy with it at this stage, but I’m determined to push on and get it done. I have two more rows of pyramids to complete and may or may not add some sashing. Stay tuned. Good news. The Christmas festivities are over for another year and it’s time to kick back and relax. After Christmas lunch yesterday we got home early enough for me to unpick about half the length of one of the short end binding strips. Yes, the last one, because it’s a rule of nature that if the job’s going to go awry, it’s going to be when you’re almost there. Maybe it’s because I get impatient to get to the end and don’t take enough care. In this case the root of the problem was that I hadn’t trimmed away quite enough of the quilt before I stitched the binding in the ditch. The binding didn’t fully reach over and therefore didn’t catch on the reverse. Yes, I sewed it down by machine. Again, it’s probably not state fair compliant but it’s quick and it’s permanent. 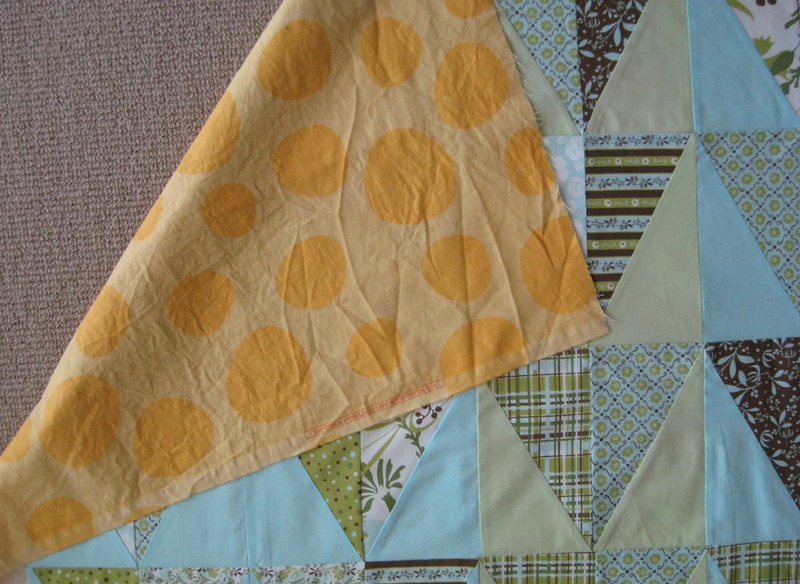 And while I don’t mind hand sewing, frankly I’ve got better things to do … like cutting my next quilt. Nine Patch Cot Quilt - Finished! So here it is, imperfect but finished. The little guy who’s going to receive it isn’t even three months old yet and, as I may have said before, he’s not going to care a whole lot about whether there are some crooked stitching lines here or there. And I’m confident his parents will appreciate a hand-made gift. I’ve learned a lot and had fun. The next one will be better.